The PlayStation 4 requires full time security authentication from a DualShock 4 controller. This means if the PS4 does not receive a response to a controllers security challenges after approximately 10 minutes, it will cease communication with the connected controller. Full PS4 Crossover Support: This is the preferred and most popular method; the ability to connect both the Authentication controller and the gaming controller to your CronusMAX PLUS via a compatible USB Hub at the same time. The advantage is that you can play for as long as you wish without any security timeouts or disconnections between the console and the controller - the security challenge is permanently available to the console. The initial setup process when powering on the console is also much more automated. If you have a PS4 console we highly recommend this method. Click here for more information on USB Hub Support. Partial PS4 Crossover Support: If you do not have a compatible USB Hub, you can enable Partial PS4 Crossover Support. As the PS4 is unable to read the security challenge from the authentication controller, the console will disconnect after 8-10 minutes depending on which game is being played and you would normally have to unplug the CronusMAX PLUS and then reconnect / reauthorize. 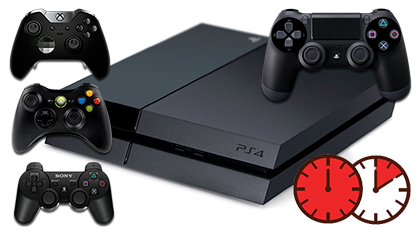 With the Partial PS4 Crossover option enabled, the CronusMAX PLUS will automatically disconnect from the Console and reconnect every 10 minutes, resetting the authorization timer. The downside is that you will have a 1 second pause in gameplay every 10 minutes. The major disadvantage of this is when playing with two players the game can reset back to the game menu or player profile causing major disruption, and some games such as Driveclub will stop the car all together while driving. This is why the above option using a is strongly recommended, you will have none of these problems when using a compatible USB Hub.